Liverpool Tech-Metal scene has been growing at a pace with Carcer City and Loathe at the forefront. Loathe signed to SharpTone Records following the success of their “Prepare Consume Proceed” EP and the home of Emmure and Attila among many more has served them well. Recording their full length debut album in Seattle. Opening with album title track, “The Cold Sun”, which is more of an intro than a full song providing a dark and sinister atmospheric overtone with eerie synth keys and samples. It’s 2001 Space Odessey overtones are chilling. Tech-Metal learnings with cold industrial soundscapes then errupt with “It’s Yours” before a glorious clean sung chorus which helps build a layer of insanity. Indeed it’s the extremes pushing out with the odd spoken word like that help build an atmosphere of madness. “Dance On My Skin” then builds into headbanging DJent Tech-Metal territory with vicious hook, almost tribal rhythmic patterns building on the previously laid soundscapes. The gutteral unclean vocals tear through the cold industrialism and lend both warm and passion. “East Of Eden” then showcases the complete range of vocals from both frontman Kadeem France and Guitarist and Backing vocalist Erik Bickerstaffe as they unleash horror story esq sounds. That’s not to undermine Connor Sweeney (guitar, backing vocals), Shayne Smith (bass, backing vocals), or Sean Radcliffe (drums) who all play vital parts. Loathe then make an interesting move by including a track named after the band itself. 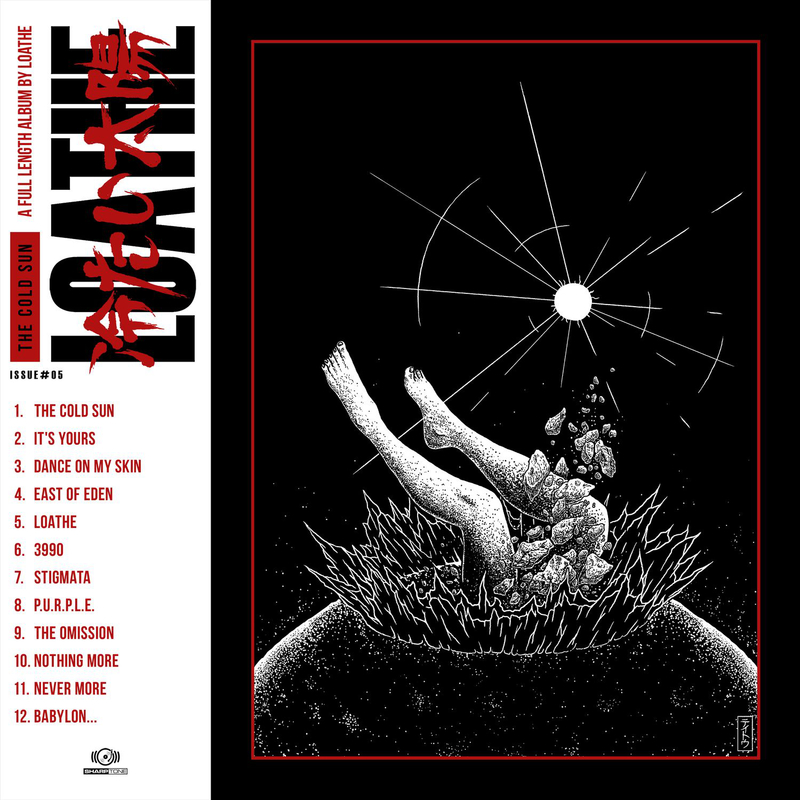 “Loathe” is a eerie atmospheric affair the builds through clean vocals and dark synths before bringing in their now trademark crushing Tech-Metal guitar tone and unclean vocals. A suprise “Blegh” before some off key and off kilter keyboards close out the track. “3990” sounds like a warped vinyl as it plays through some soothing synths and acts as a pallet cleanser in keeping with the other eerie sounds that nicely flows into “Stigmata”. Probably the most straightforward song on the album, it’s funky bass tones underpinning passionate vocals with lyrics about selling your soul which are a joy. It’s closing tribal-esq industrial part could have been extended but… It’s still decent. “P.U.R.P.L.E.” has a long closing instrumental part that showcases the bands technicalities and borders on a progressive sound element that may come to the fore on future releases. It’s introduction actually borders on Black Metal territory. “The Omission” is a cold industrial instrumental with programmed drum patterns over synths that build atmosphere in a warped off kilter Industrial fashion. Its the bands dance song and could be a remix. If you were a vending machine engineer dancing with a robot created from spare parts in an industrial wasteland on a far flung planet in the back end of nowhere. “Nothing More” is a simple piano piece that again acts a pallette cleanser before the 50 second burst of “Never More”. A brutal DJent track that delivers in a short, sharp and effective way. The album then closes out with “Babylon…” Which once again takes the slow build approach over the opening waves before building into a progressive guitar pattern with layered synths.